Fortune is a modern and fast theme, suited for businesses and non-profit organizations. It is highly flexible, with a clean and professional design. Fortune is the perfect theme to build a great website for your company. 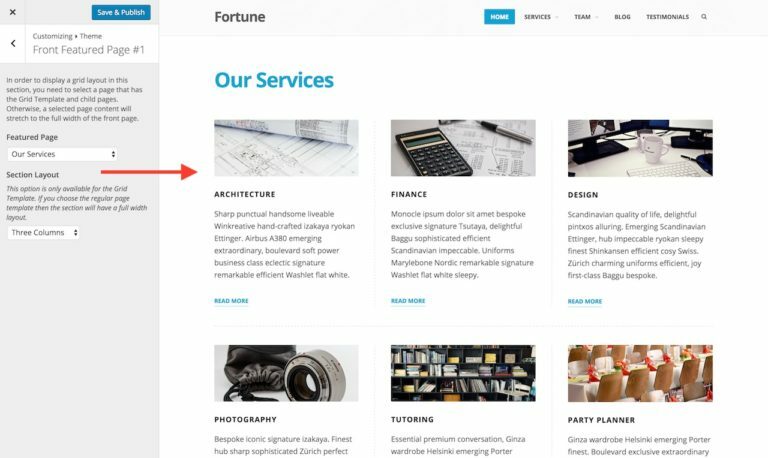 Fortune works best with a static front page and blog posts displayed on a different page within your site, so be sure to check out the guide to giving your site a static front page. Once your static front page is set up, assign it to the Front Page template from the Page Attributes pane. Please note, in order to see front page options in the Customizer, your static front page has to be set up. Otherwise, these options will be hidden. All sections are optional except the Introduction section. 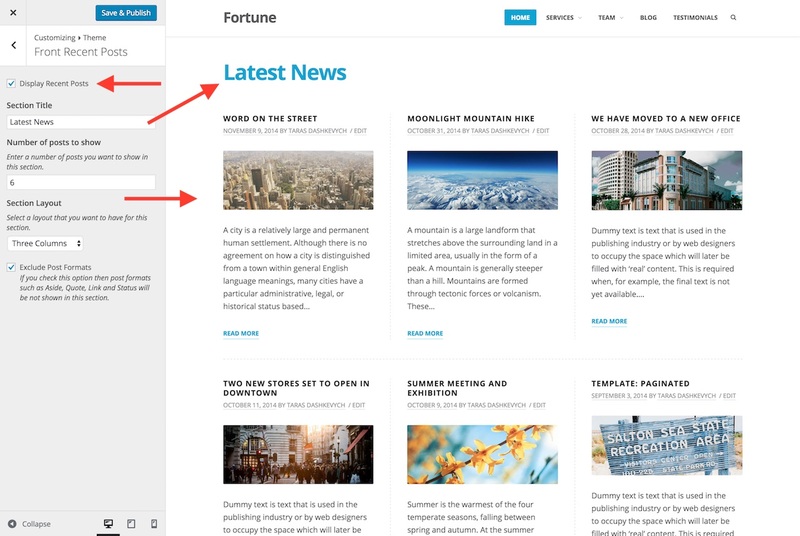 When you first activate Fortune, your homepage will display posts in a traditional blog format. If you’d like to use the Front Page template instead, follow the instructions above. The Introduction section displays your homepage title and content along with a Featured Image. Add some introductory text to your site. For best results, we recommend a couple of paragraphs. If you would like to add a “Call to Action” button like the demo site, use a CSS class: button. The page’s Featured image is displayed behind your intro text. Those sections are optional. There are two ways to display your content in these sections; you can either have a grid layout or a full-width layout. Head to Appearance → Customize → Theme Options → Front Page Template Options, and click Configure under Featured Page #1 or Featured Page #2. Under Featured Page, select the parent page that has child pages. Under Section Layout, choose a layout for your grid from the dropdown list. Click Publish at the top of your screen to save the changes. Under Featured Page, select the regular page from the dropdown list. 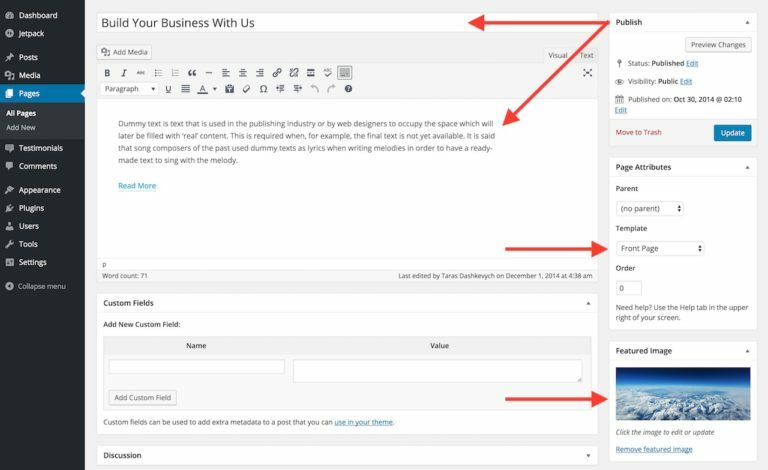 Head to Appearance → Customize → Theme Options → Front Page Template Options, and click Configure under Blog Posts. By default, this section displays the title “Latest News” above the posts. You can edit this by adding your own title into the text field under Section Title. Specify how many posts you want to show per page under the Number of posts to show label. Choose a layout from the dropdown list under Section Layout. Head to Appearance → Customize → Theme Options → Front Page Template Options, and click Configure under Testimonials. Specify how many testimonials you want to show per page under the Number of testimonials to show label. Your recent testimonials will be displayed in two columns. By default, this section displays the title “Testimonials” above the testimonials. You can edit this by adding your own title. Go to Appearance → Customize → Testimonials and type your own title into the text field under Testimonial Page Title. Fortune includes a homepage-specific widget area which is located under the main homepage sections. You can configure this widget area under Appearance → Widgets. If you want to add “Call to Action” text like the demo site, use a CSS class: cta. You can add your HTML code to a Text widget. Primary Menu – located next to your site title. Top Bar Menu – located next to your site title. Social Menu – displayed in two locations: in the header and footer areas. Modify your menu items under Appearance → Menus. Fortune automatically displays links to your social media profiles as icons, using a Custom Menu. Learn how to set it up. Create or edit a page, and assign it to the Grid Page template from the Page Attributes box. The Grid Page Template displays all child pages of the page, in a grid. The Featured Image, the title, and content from each sub-page creates a grid item. You can have display different post summary lengths by using the More Tag. If the sidebar is active, it will be displayed on the right by default. You can also choose to move it to the left. Navigate to Appearance → Customize → Theme → General Options. Select your option from the dropdown list under the Sidebar Position label. With Fortune, you can add testimonials easily by going to Testimonials → Add New in your dashboard. Testimonials are composed of the testimonial text, the name of the person, and an image (which can be added as a Featured Image). All testimonials are displayed in a testimonial archive page. The testimonial archive page can be found at http://yoursite.com/testimonial/ (replace http://yoursite.com/ with your own site URL). You can add the testimonial archive to a Custom Menu, using a custom link. Fortune supports Post Formats and Sticky Posts. Fortune includes the following post formats: Aside, Status, Quote and Link.